I was a student at Devon many years ago; when we frequently had to chase the dinosaurs off the field to play sport. I started teaching at Devon about 35 years ago. I was pregnant with my 34 year old daughter at the time and Mr Avery was in my Year 7 class. I came back to teach at Devon 21 years ago. So you can say I have seen many changes – all with the students’ best interests in mind. It is so gratifying to see that our school is growing, as it allows us to give students even more opportunities to find their passion. I believe that when a child finds their passion they will fly. I hope I can help you to either find or develop your passion this year. A little about myself: As a child I hated playing in the dirt and loathed gardening. 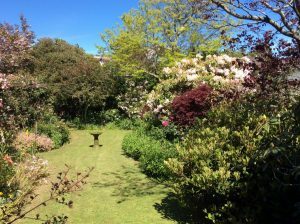 About nine years ago I bought a house with a very large garden, an ex-Rhododendron Festival property, with almost a hundred roses and pretty borders. Oh how things have changed. I purchased a pair of sturdy gloves and ergonomically beneficial secateurs. I now love gardening, although I have killed a fair few of the roses in the last nine years, and all of the pretty garden borders have disappeared. I have not looked back and feel blessed most days to live in such a wonderful paradise; even though it is a lot of work. Before my Dad died he helped me plumb in a bath in the garden. I now get to sit in a bubble bath out under the trees on a beautiful summer’s day or on a quiet star lit even. And again I count my blessings. Yes my garden gives me such joy, and also many scratches. My goal for this year is to create a cohesive, caring, cooperative class environment where students feel confident, safe and supported to make mistakes, learn from them and move on to achieving the best they can be. Past students often say I am a strict teacher, but am fair. I think it is really important that everyone gets to do their job – mine is to teach and the students’ is to learn. I become upset when students hamper other students’ learning by their behaviour. So I strongly encourage all students to make the most of the two years they have at Devon, to try new things, make mistakes they learn from and enjoy the journey.